Also included on this album would be the first version of the song that would define both him and the Jesus Movement for all time, “I Wish We’d All Been Ready.” The song would be covered an inordinate number of time, not only by other artists but by Norman himself, appearing on more than just a handful of albums that would follow. 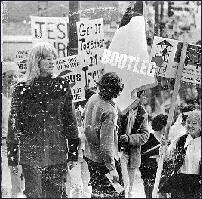 The Jesus Movement had a focal point of its ministry the idea of the soon coming secret Rapture of the Church. Theologians CI Scofield and Louis Sperry Chafer were primary influences as well as the Latter Rain Movement, a Pentecostal movement that emerge after World War ll that taught that the return of the outpouring of the Holy Spirit in Charismatic “gift” experiences would be a sign of the end times. Evangelist and “hippie prophet” Lonnie Frisbee would also play a major in the burgeoning musical genre. Normans’ music and appearance would not play well in mainstream Christian circles that still argued that drums were inherently evil and the use of modern musical styles violated God’s ordinance. there is no doubt there was also a racial component to this issue as well. Norman’s music was heavily influenced not only by modern folk and rock of the time, but by Black Gospel music as well. It would be the last nationally distributed album for Norman until the release of “Only Visiting This Planet” in 1972. In the years in between he would record and release two independent projects called “Street Level” and “Bootleg.” Both would feature grainy, underground looking black and white artwork. Both would also be “double albums” mixing live concert recording, studio demos of previously unreleased songs and future classics. Several songs from the two “independent” releases would find their way on to what is known as the “The Trilogy.” The Trilogy of albums include Only Visiting This Planet, So Long Ago the Garden and In Another Land. 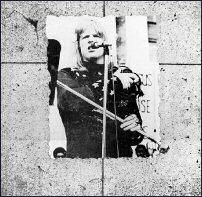 Though recognized as a trilogy of records Norman only stated that they were informally created to deal with the present, past and future (respectively) with each album focusing on one of those topics. The album was decidedly more “secular” in content than any of Norman’s other releases. But much of the controversy in Christian circles came from the original cover (pictured above) because many argued the picture of the lion in the field superimposed onto Norman’s body was an attempt to cover the fact that Norman is naked in the cover as his navel is clearly visible. The later cover (below) would be cropped at a much higher point. The album combined Norman’s penchant for 60’s blues, 50’s pop vocals and current social commentary to create a true classic worthy of more attention than it ever really received. Highlights include Fly, Fly, Fly, Be Careful What You Sing, Baroquen Spirits, Nightmare #71 and the haunting beautiful, “She’s a Dancer.” One interesting note is the “cover” of “Christmastime.” The song originally appeared on Randy Stonehill’s “Born Twice” album and is credited as being written by Stonehill. On this album the songwriting credit is given to Norman. 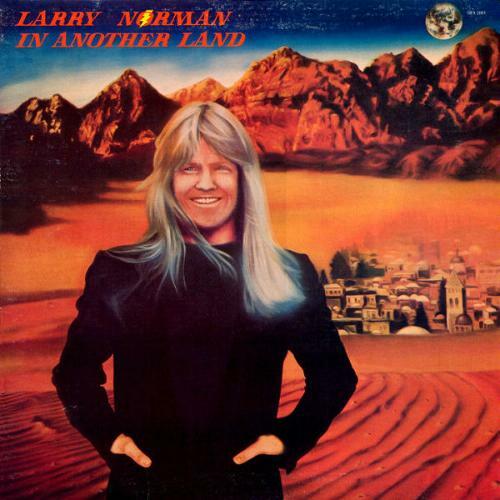 In response to many critics that he had “sold out” his Gospel message on the previous album, Norman followed up with “In Another Land.” It would take nearly three years to record and release this album that ranks a VERY close second in the list of great Larry Norman albums. This album would be released on Norman’s Solid Rock label and receive distribution by Word records in 1975. “In Another Land” would mark the first nationally distributed “Christian” album for Norman and would also mark the on again, off again love/hate relationship Norman would have with the Christian music industry and, in turn, the industry would have with him. Consider that despite his in arguable multiple contributions to the industry he was not inducted into the Gospel Music Hall of Fame until 2001. The album was not free of controversy despite its very evangelical content. The first and most obvious issue was the unseemly longhair he sported, which in 1975 was simply unacceptable at the time. The cover also received complaints because Norman’s thumbs are supposedly switched with the right thumb on the left hand and vice versa, and that, it is claimed, is some sort of Satanic imagery. “In Another Land” would contain many of Norman’s classics that would remain favorites for all time. The production is stellar and the use of limited spacing between songs keeps the record moving in non-stop fashion. Highlights would literally include the entire album! But I will note some interesting points. The cover of Stonehill’s “I Love You” in a little odd since the only line from Stonehill’s original from “Born Twice” is the first line of the song. “The Rock That Doesn’t Roll” continues the theme of “Why Should the Devil Have All the Good Music” and would inspire countless musical defenses of Christian Rock. But rather than being a song about Christian Rock it is simply a play on words to describe Jesus. It is also the song that contains the lyric the album titles is based on. « SCHAEFFER SUNDAY Katha Pollitt versus Scott Klusendorf on abortion rights!! !